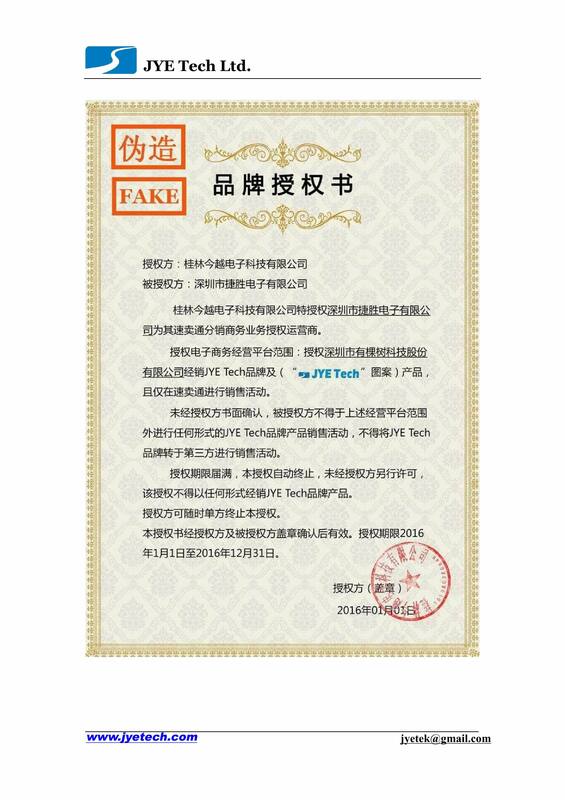 The following are compilation of JYETech statements on counterfeit products and their sellers. Please download these statements as supporting documents if you open dispute against fake kits sellers. If any further assistance is needed please contact JYETech at jyetek@gmail.com or jyetech@163.com. Uploaded statement on fake board ID (or Product ID). Currently the following board ID's are identified being cracked. Last edited by jye1 on Thu Jul 26, 2018 11:46 am, edited 4 times in total. Hi i buy also a fake on Aliexpress and open a dispute after i finde out it is a fake. I used the evidence you post but seller will give no refund and post this as evidence. I can't read chinese so i have no clue what they will tell me. The second document was a receipt of trade mark application. 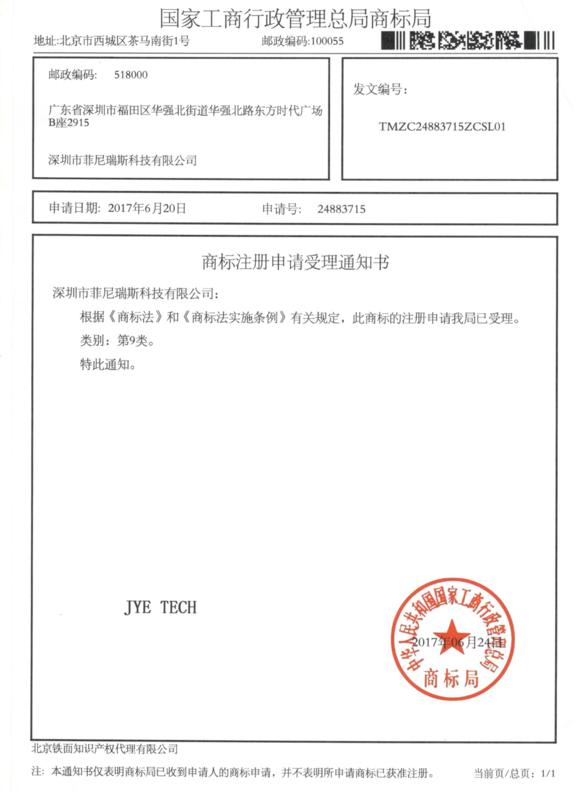 The company named “深圳市菲尼瑞斯科技有限公司” (denoted as "F Company" below) has filed an application for registering "JYE TECH" as its trade mark and has received that receipt indicating that the application was accepted. 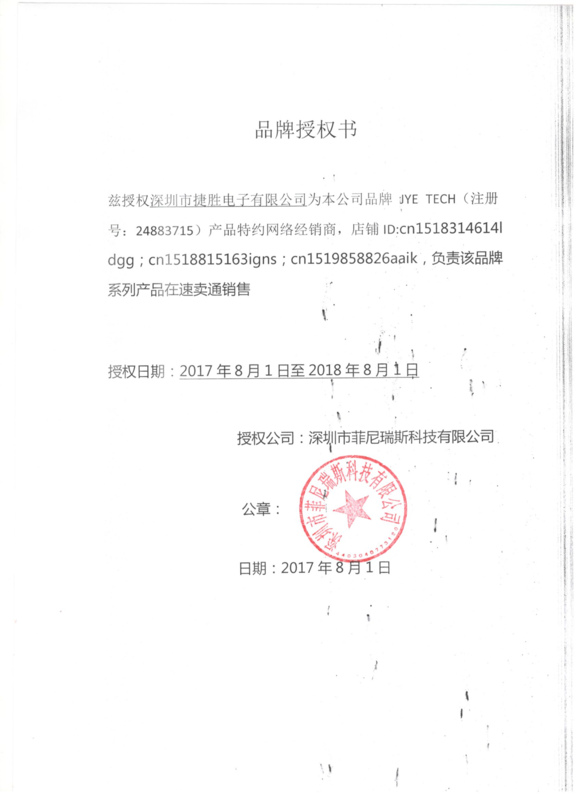 The first document was an authorization issued by F Company to another company named “深圳市捷胜电子有限公司”(denoted as "J Company" below) to allow it to sell products in the name of "JYE TECH". The J Company is the owners of several Aliexpress stores. The document listed the store ID's without names. It likely includes the store you are dealing with. We have strong proof that F Company and J Company have exactly the same address - same building, same door number. That's to say the two companies are actually the same guy. Acceptance to a registration application does not mean the registration has been done. So the application receipt they displayed does not have any legal effect before final trade mark use of allowance is granted. We have been used "JYE TECH" as company name and trade name since 2010. We have strong ground to appeal to trade mark authority to block the registration. On the other hand, no matter they sell the product in the name of "JYE TECH" or not it can not change the fact that the product is fake. 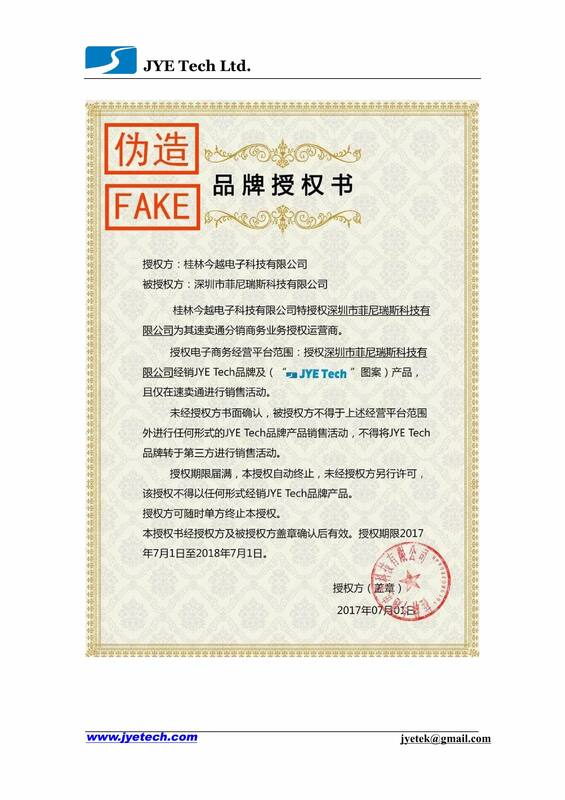 Ironically, J Company (in 2016) and F Company (in 2017) made fake documents claiming that they had got authorization from JYETech to use the trade name "JYE TECH" (Please see page 4 and page 5 in our statement below). They had used these fake documents to cheat Aliexpress and customers. They produced and stamped fake company seal in these documents and this is criminal action in China. We reserved the right to take legal action against the companies. We have made an official statement towards Aliexpress to point out the facts stated above. We also strongly request Aliexpress to stop the stores selling counterfeit products so as marketplace fairness is maintained and customers' interests are protected. 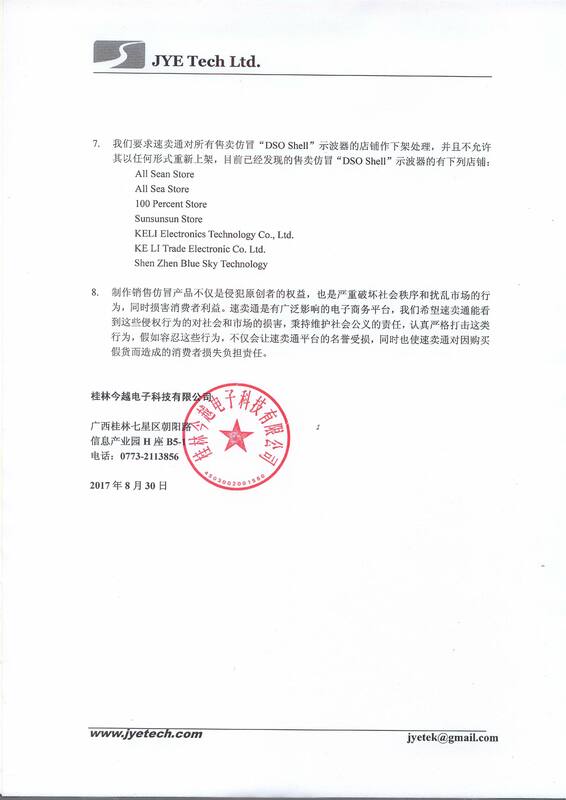 Customers are encouraged to upload the statement (provided below) to Aliexpress if you opened dispute with any stores that sell fake DSO Shell. The statement is in Chinese. English version will be available later. My dispute will end tomorrow and than AliExpress has to step in. We will see how they decided about my dispute. I will let you guys know about the result. Just a heads-up, but eBay is absolutely full of Fake DSO150/DSO Shell kits. All show the circuit board bearing the printing "DSO Sheii" - note the "ii" rather than "ll". I hope everyone who sees one of these "Sheii" kits will report them to eBay. Before I spotted this, I bought two of these Fakes while trying to buy a 2017 revision kit - my apologies to JYEETech. Better yet, everyone go and buy any/all of these kits they can find on eBay then claim refund on eBay for Fake product. You'll get a bunch of free components and the seller looses 100%.... no cost to you at all. They'll soon stop selling fakes. The problem is that " they " will all claim that " they " hold the rights to the jye-brandname and are so " authorized " sellers . The only solution is steps by jyetech against this fraud. Have a look at the E-bay and ALI-Express feedback for this sellers , " THEY " have about 100 % POSITIVE feeedback ( HOW is THAT possible ?? ) by hundreds of buyers , apparently there is high demand for fake units . I bought my genuine scope from Banggood. 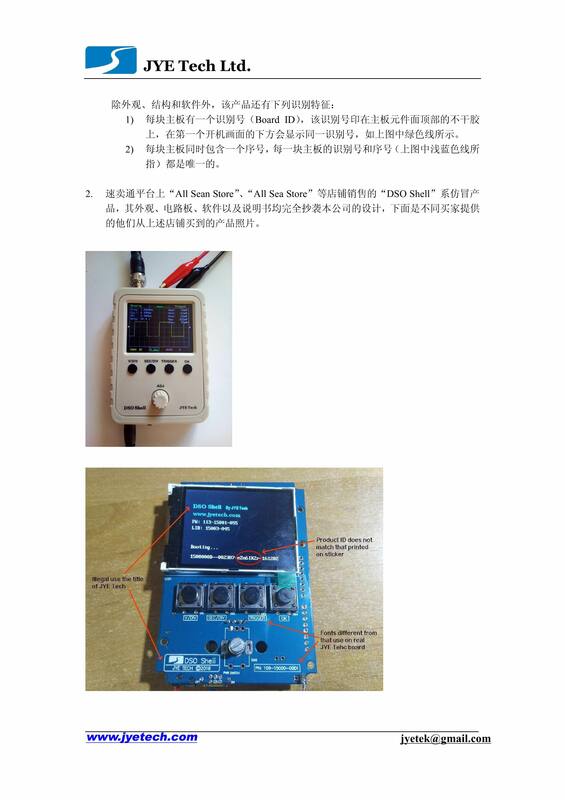 I think others here have done that, and nobody has claimed to have received a fake one from Banggood. I would just strongly recommend buying this kit from them. You aren't going to get a noticeably lower price anywhere else, and for people in the US, they even have stock here now. Around US$21 last time I looked. - bought a DSO Shell from "100 percent Store". On first firmware update the board came out as fake. 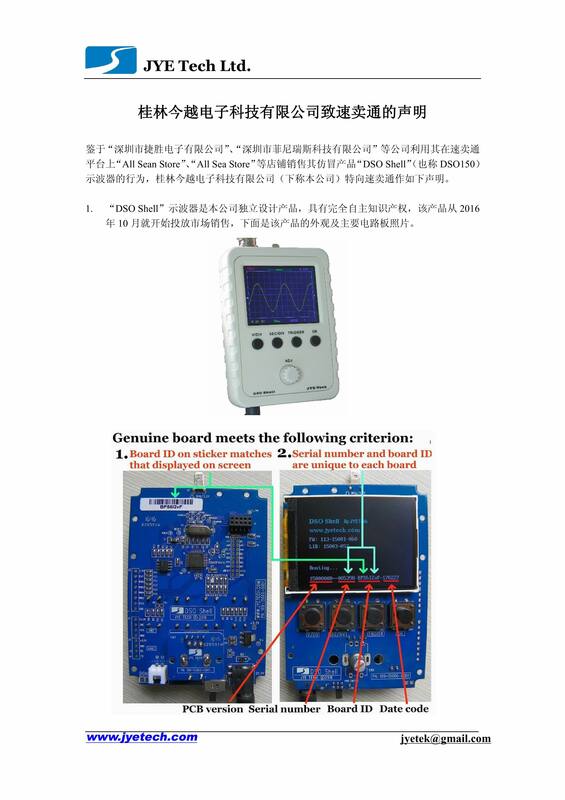 - opened a dispute for "counterfait goods" uploading a photo of the scope boot screen with "this board is fake"
- AliExpress judge said "counterfait goods not valid, no refund"
- I refused the agreement and uploaded the Jye Tech "statement of inspection" with a photo of the board showing the logo "DSO Sheii" in place of "DSO Shell"
- Aliexpress judge said "counterfait goods valid, full refund"
- Bought DSO Shell from "All Sean Store". Product Page indicated "By JYE TECH". It even ships from Aliexpress warehouses. I thought this was a genuine item. - received the item, went to JYE Tech site to get a firmware update. - Provided pictures of the item. - Seller provided evidence = the exact same documents that were provided to "GiantBrain"
- Buyer re-uploaded the 6 page statement above - Still waiting on AliExpress. The silkscreen of the new counterfeits no longer has "DSO Sheii" and I believe this may prevent the inspection document to be truly effective. 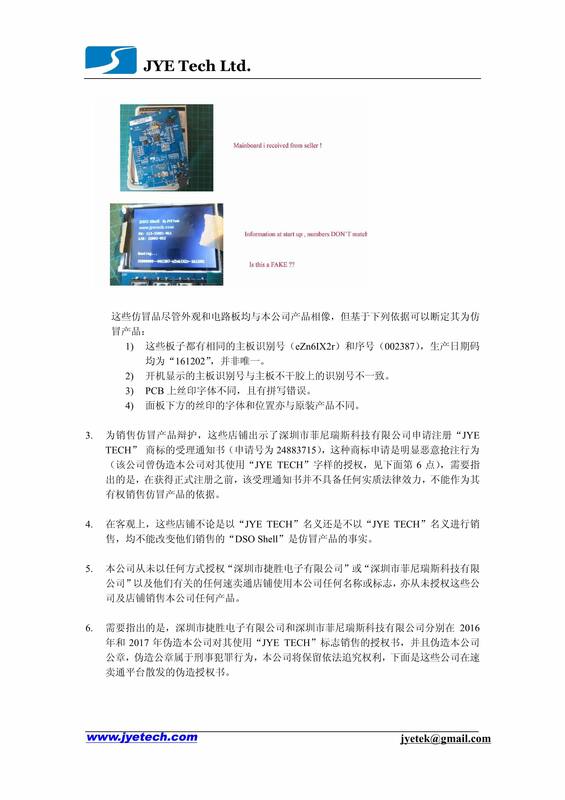 Since I don't read Chinese, would it be possible for JYE Tech to directly address the documents the seller has provided and create a new document that reflects the latest counterfeit? We upload a new statement for the board you mentioned. Please see the first post above. Thank you for the support!